Less than a month ago I read ‘Reasons to Stay Alive’ and it left such an impression on me that I was keen to read ‘Notes on a Nervous Planet’. The thing that always strikes me is that Haig is so honest in his writing. His willingness to share personal experiences and his successes (and flaws) makes it such a relatable read. The irony of this book is that I was introduced to Matt Haig through social media. Yet he makes a very good point about the impact, sometimes negative, that such things can have on our lives. Having felt anxiety levels rise over the years (and working with the young people of the 21st Century) this book certainly encouraged me to re-evaluate my use and potential reliance on social media. This book also reminds you that the simple things in life are worth enjoying. After all, do we really need a 24-hour life? Our bodies are made for sleep, so let them sleep. Give yourself the chance to recover from whatever the day has thrown at you. Follow some, if not all, of the guidance Matt Haig offers and you will start to realise that we can not control everything around us, but we can support ourselves to reduce our nervousness. You will also learn some history as you go and it will spark some other paths of interest that you may wish to follow. So, slow down, pick up a book and take a little break from the Nervous Planet. This is the third Lisa Heathfield novel that I have read this year. Again, I was surprised by the book, different again from the previous two, but still a compelling read. This novel focuses on the lives of a group of travellers who tour with the Circus, and especially on the sisters Lo and Rita. Great to read another novel with strong female characters. I would consider this a coming of age novel, as it really tackles the complex fabric of relationships for both girls: their relationship, family relationships and romantic relationships. For Lo, everything seems difficult as she has fallen for a boy outside the trusted Circus circle and she is having to carry an additional secret that is almost suffocating her and her existence. Rita, despite her odd moments, feels that tradition of their family carries more weight than it seems to for Lo. However, one moment for Lo will change life forever – for everyone. Despite it all, it may even bring everyone closer than ever before. This was not as tense to read as ‘Seed’ and ‘Paper Butterflies’; although it is still full of emotions and difficult ideas, it is a little more gentle on the reader. I still finished it while continuing to think about it as the last word is fading. I am grateful to the Twitterverse and Bookstagram for introducing me to these fascinating YA novels and, in turn, I have been able to share them with other readers. Hayley always seems to pass on the most fabulous books and this was no exception. I had not heard of this title (clearly my head had been in the sand) but I was intrigued when I read the blurb on the back. I love a mystery novel, so was more than happy to give this book a go. From the moment I started this book I was hooked. In my first sitting I read 125 pages; I just could not put the book down (pretty sure I should have been doing something else but clearly that was forgotten). I loved how the novel was structured, the narrative came from a variety of characters, which kept my interest in the novel even more. Jewell smoothly transitions between the viewpoints of different characters, bringing depth to the story. I always find it difficult to blog about mystery novels as I never want to spoil any part of the plot. The twists and turns in this plot are not always a surprise, but this does not take away from the novel as the story is rich enough. After having finished this novel, I would be keen to read other titles by Lisa Jewell. This was, after all, the perfect summer mystery read. Have you discovered any new authors this summer? Any recommendations? A friend of mine sent me a message asking me if I had this novel. As I hadn’t, I immediately knew it needed adding to my ‘to-be-read pile’, so after a trip to Liverpool, I found myself a copy and knew I had to give it a go. This is a ‘wow’ novel – I had no idea what to expect when I started this book but the one word that sprung to mind as I read the final words was ‘wow!’. This novel is narrated by Eleanor Oliphant, a complex character, it transpires, and rarely have I read a novel that really pulls you into the mind of character. As I read every word, I almost felt like I know Eleanor; well, the Eleanor at that moment, as she is such an intriguing character. As the story unfolds, you realise that maybe Eleanor does not know herself and that we are in fact on her journey of self-discovery with her. Has she really been living life for the last 30 years? I can not reveal any spoilers because I believe that books are to be read and enjoyed by each reader. However, I will say that this books will stay with you when you finish it, as it has rather an open ending. This is a debut novel that deserves all the credit it is receiving and I will certainly be recommending it to readers, just as it was recommended to me. Any great books been recommended to you recently? Welcome to 2018 – I hope that it is a very happy reading year for you all. I am starting this year just rounding off the final two festive reads that made it into the end of 2017. (I am still reading a festive-themed book at the moment, but it is not finished, so I can not quite sneak it in there just yet). I have not read many PD James novels, but I have listened to radio adaptations and watched TV versions, so I decided that I wanted to give some of her works a go. After enjoying a collection of short stories earlier in the year from Jojo Moyes and being attracted by the festive title, I decided on this one. I do have admiration for authors who can tell a story in such a short space of time, especially a crime story (I am a huge Sherlock Holmes fan, after all), and PD James does this in these stories in such style. What really impressed me was that they had some dramatic twists in such a short space of time. Those that are big fans of her detective, Dalgliesh, will not be disappointed as he does make an appearance in some of the tales employing his critical thinking skills to find the solution. For a festive read (or at any time of year if you are crime fiction fan), I would certainly recommend this book. I remember being introduced to the work of Nancy Mitford by my mum in my early teens. I had always been fascinated by the Mitford sisters, as there is so much drama surrounding that name that they engage the imagination of so many of us. Nancy’s novels are so full of social observation and gentle humour that they are simply a joy to read, and this book was no exception. All based around the festive season in the countryside, and all the pomp and ceremony that comes from that, but of course the complex and sometimes ridiculous love lives (or not) of all the characters that are involved. It has you giggling (and even possibly slightly cringing) from the very beginning, and you can not put it down as you are simply too intrigued about what is going to happen to each of the characters. For a full-blown 1920s Christmas experience, this is the book to read. Any festive read recommendations out there to get me ready for this year? October was an exciting month for YA fans because John Green’s newest novel was published. Like many fans, I ensured that I purchased a copy and, from that moment, it was topic of conversation with so many other book lovers. Now, I know it is November, but my ‘to be read’ pile is always growing and I have a strict one-book-at-a-time rule, so I got this title a little later than I would have liked at the beginning of November. I was hooked from the first page because not only is John Green a wonderful storyteller but the characters that he creates are always so engaging and so real. I may no longer be a teenager but I can still relate to some of these characters and the experiences that they go through. He also tackles issues that are part of our everyday lives but sometimes are considered taboo or simply are too difficult for some people to talk about. A novel is a chance for people not only to escape, but also to gain experience and grow as individuals. The central theme in this novel is mental health. It is a sensitive but engaging exploration of not just how the issues can impact one individual but those around them. A moment that really struck a chord for me is when the central character, Aza, realised that she was a character in her best friend’s Star Wars fan fiction. As she saw herself there, she has a real moment of reflection about herself and how others view her. It goes on to be a wonderful turning point for her, even if it is not the easiest moment for her to handle. There is so much in this novel and I do not want to spoil the full tale for anybody. All I will say is that if you are a John Green fan, and even if you are not, this is a wonderful book to read, especially with all the positive attention that mental health is finally getting in today’s world. 6 Months Blogging – Happy Half Birthday! 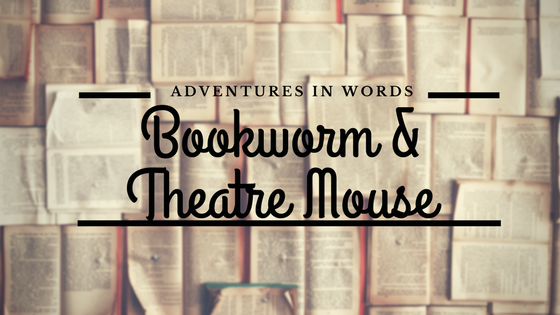 A chance to share what I love: Books and theatre are my passion and have been for a long time. It is a joy to be able to share my thoughts with you all about both of these subjects, and hopefully encourage other people to enjoy them too. The support of people out there: The messages on Instagram and Twitter that let me know that people have liked what I have written and visited my little blog. Trying something new: This blog has encouraged me to look beyond the things I know I love and try new genres and styles. It has been a pleasure to see amazing plays that I wouldn’t have necessarily tried before, and discover brilliant authors and unforgettable books. A chance to do something different: Hobbies are so important and this is a great one. It also means that I find inspiration from the amazing community out there for my other hobbies (Harry Potter cross stitch is one of the best so far). Looking to the future: The chance to keep developing this blog is something I look forward to every day, learning new things and adding more little stories – bring on the next 6 months! International Women’s Day first really came to my attention when I was living in Italy, as they celebrate Women’s Day every year. Beautiful yellow flowers are handed out to the women and families celebrate the women in their lives. It was such a lovely tradition. As I have thought back and remembered that day, I have decided to think about the females in fiction that I have loved, as I have grown up reading so many wonderful books. They need a little bit of celebrating too. I was an enormous Roald Dahl fan as a child and, to be honest, I still am. I do not believe that he wrote books that were only to be enjoyed by children. I can remember the birthday that I was given three Roald Dahl titles as a gift and Matilda was in the collection. She is already ideal to me because she loves books and she does not let being a little girl stop her from achieving exactly what she wants. She may not feel that she always fits in, but she has so much character and is a great role model for fans of her story. I first met Beatrice as I studied A-Level English Language and Literature. She is someone who appealed to me straight away, as she is not your typical heroine. Beatrice is a witty and independent figure, and seems very different to many characters of the time – she may appear cynical about happy endings but, in fact, desires them more than most. She is someone that I would love to have as a friend; she would cheer up any situation and would certainly tell you to ‘get over it’. Now, let us all be honest: there could have been any number of characters that could have been plucked from the pages of Austen’s works; however, for me it has always been Emma. I am not entirely sure what appeals so much about Emma, as I can totally recognise that to some she may be a little irritating and misguided. Yet, when I first met Emma on the pages of Jane Austen’s novel, there was something that I found charming. She wears her heart on her sleeve and all her actions are, she believes (most of the time), to benefit others. Emma may get a bit carried away and does not always go about things in the right way, but she still is a lovely heroine and learns her lesson. Even reimagined in the recent retelling by Alexandar McCall Smith, I thought Emma was great! Hermione may be one that many of you expect but she has been a female character that I have learnt to love as my love for these books has increased. I am not going to lie – at the start, I had a similar reaction to her Ron Weasley but, as he did, I learned to love her. Hermione is a strong, independent young woman who (very much like Matilda) does not let anything stand in her way. She is one of the bravest female characters I think you can find in fiction, and the most fiercely loyal. The friendship between her, Ron and Harry is inspiring and shows that gender should never stand in the way of true friendship and adventure. Great female characters don’t always have to be central to the stories they appear in. In fact, many have an important supporting role too, and Mrs Hudson is one of those characters. As the long-suffering landlady of Mr Holmes, she must have seen all sorts treading the famous stairs of 221b Baker Street. Mrs Hudson may not always have a voice, but she has nothing but affection for Holmes and Watson, and offers them great support – even if it is as simple as a cup of tea. Who are your favourite females in fiction? This choice was made thanks to the world of Twitter. #BookClub140 from ‘Parker and Me’ (which was introduced to me by the lovely ‘Hayley From Home’) selected this as the February title ahead of a Twitter chat at the end of the month. Therefore, it grabbed the accolade of Book 6 in A Year of Books 2017. ‘A Boy Made of Blocks’ was a touching tale with a colourful collection of characters. They are all instantly likable and are all facing different adventures in life. At times each is facing a challenge, but as they do so it is also a journey of self-discovery. You root for each and every one of them as you follow them on their adventures, even if you do not always agree with the choices that they make. It is a real page-turner that can cause a roller coaster of emotions and occasionally catches you off-guard, as you realise that you may be shedding a tear or two. (Always a good look on a busy train on a Sunday afternoon). The relationship between Alex and his son Sam (a boy made of blocks) blossoms beautifully throughout the book and shows that sometimes you have to be willing to embrace an adventure whatever form it may take. You may even make it through successfully and realise that you are braver and stronger than you think you are. It is a tale that really does make you hope for a happy ending (although you will have to read it yourself to see if that wish comes true). If you enjoy titles like ‘About a Boy’ by Nick Hornby and ‘Man and Boy’ by Tony Parsons, then this is a book for you. There is not a more wonderful name for a book as January blues may be taking hold. This is a charming little book, published earlier this month, which perfectly showcases the work of Chris Riddell. An incredibly talented artist and illustrator, he has brought together 100 hugs that will bring a smile to your face. These little beauties are interspersed with some lovely quotes from literature and its great figures (could there be anything better for a Bookworm?) A favourite: ‘Never love anyone who treats you like you’re ordinary’ – Oscar Wilde, opposite a wonderful little drawing of hugging pirates. Although, picking an ultimate favourite is difficult as everything about this book will bring a smile to your face. So…if you’re ever in need of a little cheering up, this is the book for you!